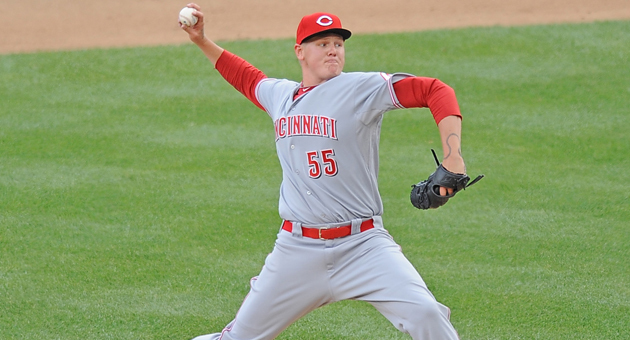 Am I Allowed To Take All the Credit for Latos’ Win Over the Giants or Just Some of It? So, which is it? All or some? I guess I’ll settle for just some. I mean, I wasn’t actually pitching for him. I just posted a picture of my authographed “I Hate SF” ball as motivation, and boom… Latos throws seven shutout innings and gets his first win in a Reds uniform. 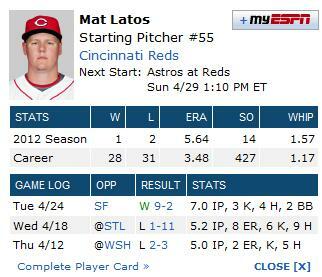 Oh, I also called out ESPN, who you might have heard of, for not having an up-to-date photo of Latos on their site. This morning… here’s what you see. See that? I speak, things happen. Nice to know the media mogul that is ESPN is crawling with lobsters out in Bristol. This entry was posted in Uncategorized and tagged Giants, I hate SF, Mat Latos, Padres, Reds. Bookmark the permalink.